Liquid floor screed is designed to provide a smooth level surface in both commercial and domestic properties prior to the application of any chosen floor finishes. It’s suitable for use with underfloor heating and is often used for this purpose. Liquid flooring screed is also commonly known as Flowing Floor Screed, Flo Floor Screed, Anhydrite Floor Screed, Hemihydrate and Gypsum. Interestingly, there are also several brand names used for Liquid Screed Floor in London which include Gyvlon, Truflow, High Flow, Cem Flo, Hope Flo and Belitex. Ultimately, all of these are Liquid Screed Flooring. When it comes to installations, Liquid Flowing Screed can be used in both new build and renovation projects. It is suitable for domestic and commercial buildings and has been used in hospitals, schools, colleges, department stores, hotels and airport buildings. Many of these located throughout the United Kingdom and cities including London. Looking for a Flat Screed Floor? The standard installation tolerance for liquid floor screed is SR2 +/- 5mm under a 2m level. A traditional floor screed is generally installed to an SR3 tolerance which is +/- 10mm under a 2m level. The flatter the floor screed the easier it is to lay floor finishes. Liquid floor screed is pre mixed and the viscosity is checked prior to installation to ensure it is consistent and in line with the manufacturers’ installation guidelines. It is very difficult to put quality control measures in place with traditional screed as there can be wide variations during site installation. Gyvlon floor screed has extremely low shrinkage which reduces the risk of cracking and will not curl. Flowing Floor Screed can be laid at lower depths than a traditional screed, 25mm bonded, 40mm on to insulation and 50mm on to underfloor heating. The reduction in depth can result in liquid screed being a more competitive option than sand and cement. 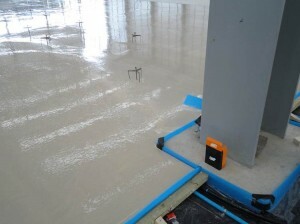 The reduction in depth also means that the screed is ready to receive floor finishes quicker than a traditional screed. See our technical information page to make direct comparisons for your project. 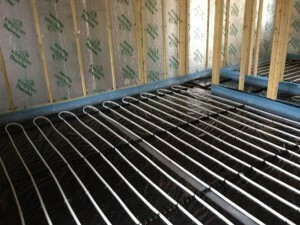 Lower depths in screed will also make an under floor heating system more responsive during heat up and cool down. Why choose us for your London Flooring Project? As experts in the installation of all kinds of concrete and screed flooring across the United Kingdom and London. We are confident that we can install a defect-free liquid screed floor. This is why we offer a 5-year insurance on all screed floors we install, backed by our no-quibble guarantee. Our London based installation team have vast experience of laying screed floor with underfloor heating systems too. You can trust us at Midland Flooring to have the know-how, experience, and technical expertise to complete the installation and complete it well! Why choose Liquid Screed Floors? Using up to a third of recycled materials, liquid screed floors are becoming the most sought after flooring solution for both domestic and commercial customers. Screed floors are robust, hardwearing and are noncombustible too, tested to part 4 of ZB5476. Great service from Midland Flooring for our Liquid Screed Flooring installation in London.